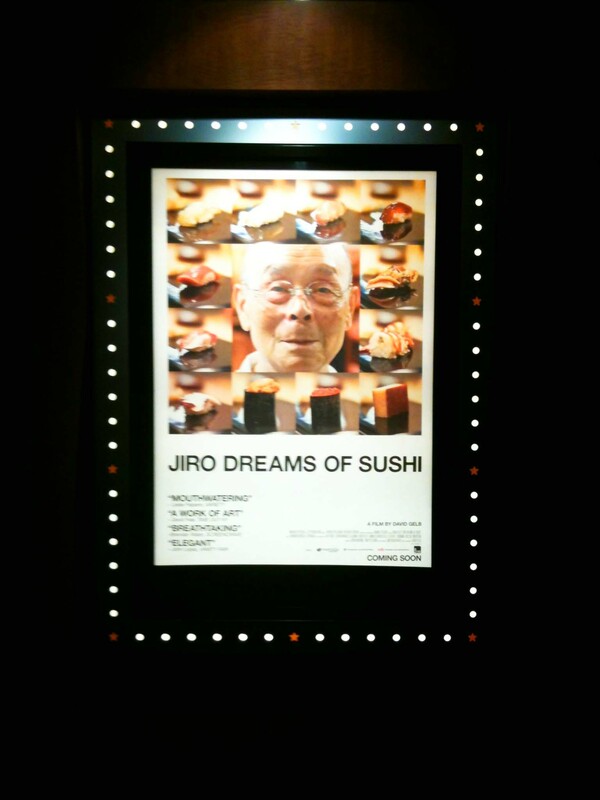 Last night I went to see, what has now become my favourite food movie, Jiro Dreams of Sushi. It’s a beautiful and inspiring documentary about 85 year-old Jiro Ono who is renowned as the world’s greatest sushi chef, the first to ever to receive 3 Michelin stars. It was a movie that tickled my senses with gorgeous food imagery that I could taste through the screen coupled with a wonderfully moving score that helped to weave together the story being told. What resonated were the many “aha” moments of clarity in the themes surrounding dedication, obsession, family and the search for perfection. Being able to understand most of the movie in Japanese, I think I took away more than those reading the subtitles, as some of the sentiments were “lost in translation”, but nevertheless it’s a must see for any food lover. Last night, I fell asleep thinking about some of the best sushi I’ve ever had in my life. I know that I’m lucky to have experienced some pretty special stuff in Japan, and here on this side of the Pacific too. I kept trying to imagine how much better Jiro’s sushi could be than the best I’ve ever had. Sadly, I woke up knowing that it’s probably THAT MUCH BETTER. I spent my morning with sushi on the brain and knew that it had to be really good sushi in order to meet the expectations of my craving. Right now, my “go-to” favourites for a delicious Japanese lunch is the sashimi bowl at Kingyo & Suika (I think the Suika one is better). But seeing as I was at work today, I knew just the place I wanted to go. 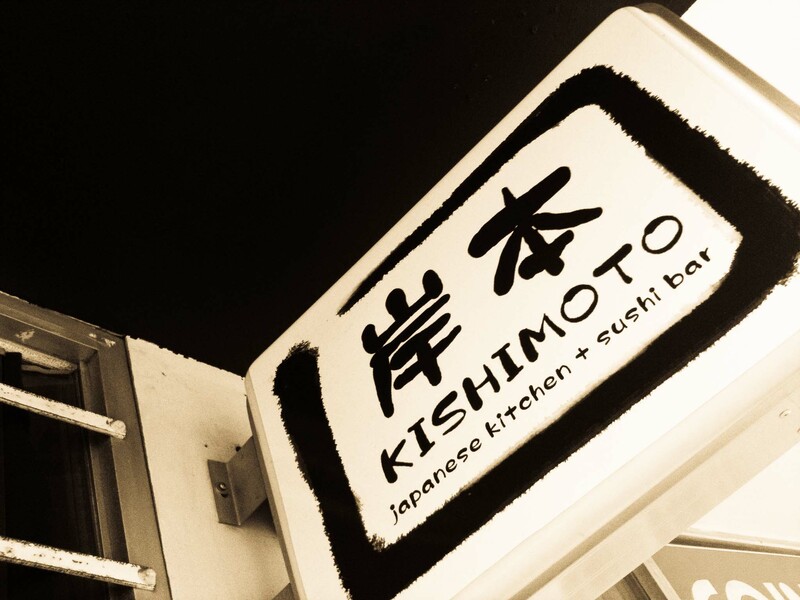 Kishimoto has been on Commercial Drive since last summer and I can’t believe it’s taken me so long to try it. Not knowing what I wanted for dinner last week, I picked up some rolls for take-out and I was wowed and I’ve been jones-ing to dine-in ever since. I apologize in advance for my crummy photos. I was going to wait to go back to re-take proper photos, but I’m finding I’ve become highly critical of my photos lately which is part of the reason I’m not posting as frequently as I’d like. In an effort to improve, (very important to Jiro-san) I am going to post these photos in their less than perfect state, (something in total contradiction to Jiro-san’s values). The chef/owner Kishimoto-san was previously at Ajisai(Kerrisdale) and Zipang (my neighbourhood joint). Both are on my “very good” list, but I know what made both extra special was Kishimoto-san’s creativity. I know creativity of Kishimoto’s sort is outside the realm of what Jiro-san would consider to be excellent but just as not all pizzas are created equal, I believe that there can be a wide criteria of what can be considered good sushi. And no, I’m not talking cheap and lots of it. I have only scratched the surface on the menu at Kishimoto, but from what I’ve experienced from Zipang, his creativity shines in his makizushi (rolls). The rolls I ordered were inventive, but the key elements; taste of rice, ratio of rice to other ingredients and quality of ingredients, are stellar. 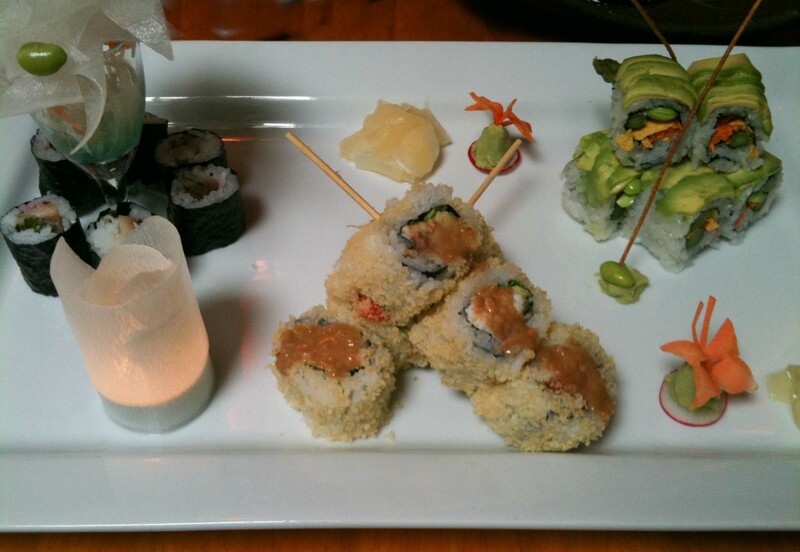 Instead of being gimmicky, the “special rolls” are aesthetically pleasing and made with surprising combinations. Bonus points for showing his Osaka-roots (my bias) with this salmon oshi sushi. 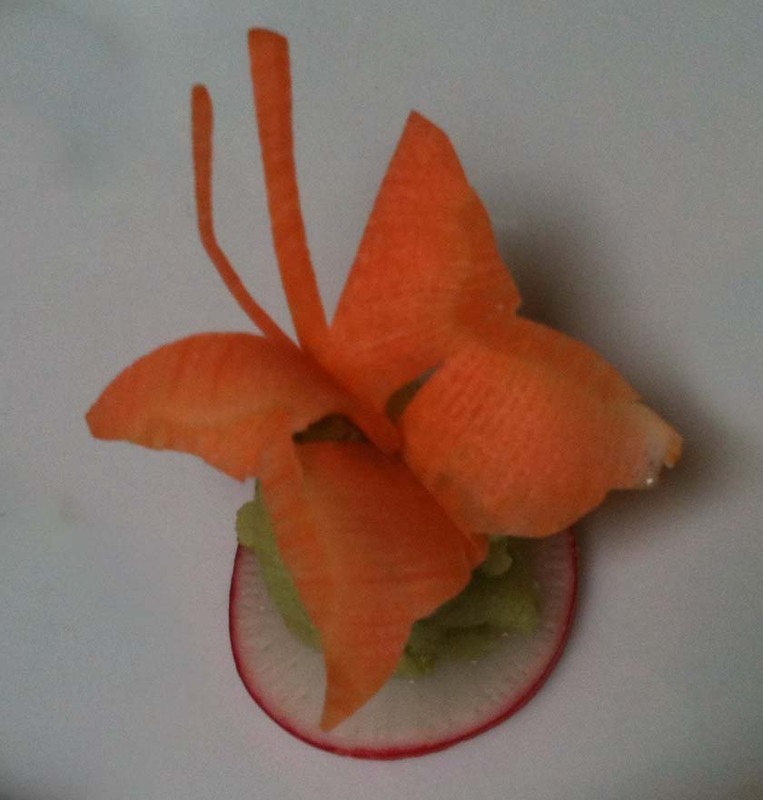 A single slice of carrot, cut and folded into the shape of a butterfly. A great example of the amazing attention to presentation. Nasu dengaku (fried eggplant with a sweet miso sauce) because I love to have 1 fried dish with my sushi. All in all, a fantastic lunch at a restaurant I’m looking forward to go back to. As for Jiro-san’s tiny restaurant? Well it’s now on my “must try before I (more likely he) die(s)” list. 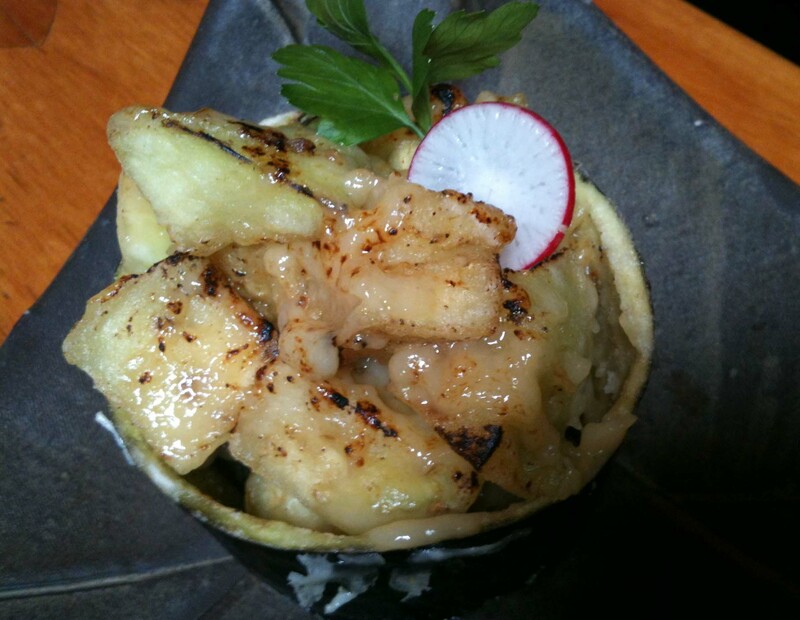 Hey Susy, We went to Kimura last night on Rupert, turns out he and Jiro are buddies. I think they are about the same age.